Woohoo! I'm so excited. 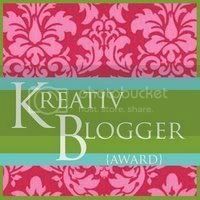 I just received my first blog award! Thank you, thank you to Crystal at The Italian Bella Diaries for awarding me this honor. Thank the person who gave the award to you, post the award on your blog or in a post, nominate 10 blogs which show great attitude/gratitude, link to the people you chose on your post, and comment on their blogs to tell them about the award! Please visit these great blogs and leave some comment love!